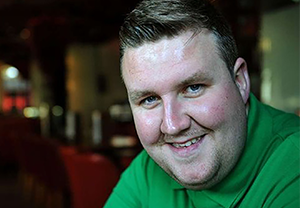 Darren Farley is now firmly established as the No.1 Football Impressionist in the UK. Labeled the voice of football, for his hilarious impressions of the biggest names in the game, Darren has amassed more than 50 million hits online and has gained a loyal following on his YouTube channel, The Darren Farley show. He has been a regular on some of the biggest football TV and radio shows in the UK such as Soccer am, Football focus, Question of sport, Sky sports, BBC match of the day and Talksport as well as also appearing on TV and radio around the world. Darren has been head hunted by major brands such as Adidas, Pepperami, Ronseal and Liverpool football club to star in online advertising campaigns due to his popularity online and is currently starring as the Face of Coral Bookmakers in their TV commercial campaigns. Darren has also become a big hit on the corporate/after dinner circuit traveling the UK and Europe to perform his hilarious act.